11 Young musicians will be auditioning for four places in the final of the 2019 Sussex Young Musician of the Year Bursary Competition. Audience entry to the auditions is free. Coro Nuovo is holding a BBQ to raise funds for Sussex Young Musician Bursaries. There are a limited number of tickets so early booking is recommended. The concert includes the finals of Coro Nuovo’s Sussex Young Musician of the Year Bursary Competition. Tickets are £12.50 standard and £10.00 concession. Please check back for further details of this concert. Please check back for further details on this concert. This concert celebrates the 250th anniversary of Beethoven’s birth. 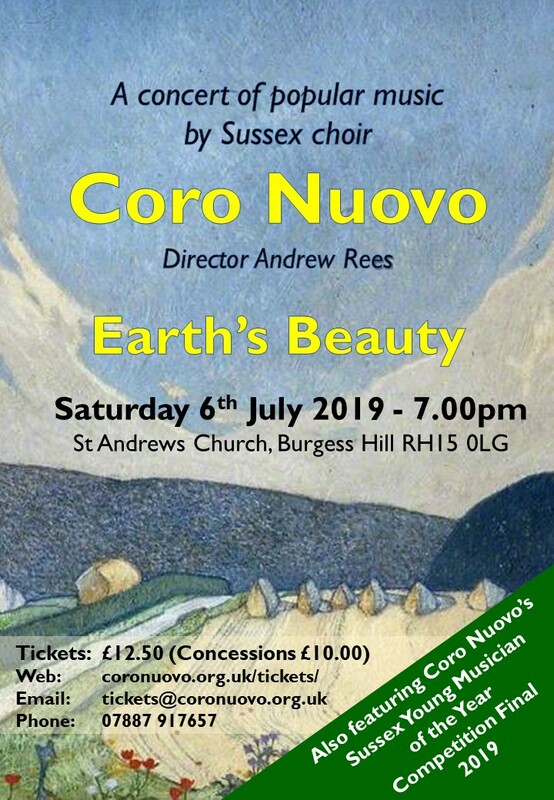 Coro Nuovo will be taking part in Mid Sussex Sinfonia’s performance of Beethoven’s 9th Symphony. CONCERT – Sunday 28th March 2020 @ Tbc. This is a joint concert with the Welsh choir Côr Llanpumsaint a’r Cylch.